While iOS has quite a few apps that are AppRadio compatible, the recently introduced Android compatibility through AppRadio 2 only has less than a handful. I'm sure the list is going to keep growing as it happened when the original AppRadio was launched in June of last year. 1. Waze: This is the big one for me. The iOS version of Waze isn't AppRadio compatible yet. Waze is a free social GPS & Traffic logging app which allows users to report traffic conditions, accidents, etc. to help other travelers. 2. AUPEO! Personal Radio: AUPEO is an internet radio station tuner which allows you to choose from over 100 stations. What makes AUPEO different from others is that you can fine tune the music that will play for you depending on your 'mood'. Yes, it has moods and sub-moods you can adjust! 3. CarMediaPlayer: Android users may need CarMediaPlayer because AppRadio 2's stock Music app is drawn from the iPhone's iPod interface. With CarMediaPlayer you can get the fluid experience of using an iPod, swipe controls, alphabet search and much more. A recent update of this app has fixed a few bugs. 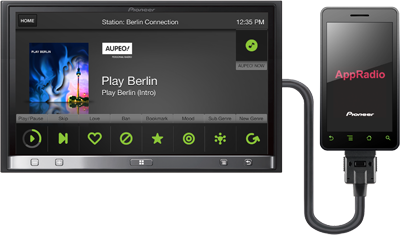 CarMediaPlayer is developed by Pioneer themselves. 4. Pandora: Everyone knows what Pandora does. It is possibly one of the most commonly used music streaming apps out there. Just in case you didn't know, Pandora allows you to add and listen to music stations based on Artists or Songs. It's similar to Apple's Genius feature on iTunes. 5. DashCommand: If you are a car junkie and like to visualize what your car's engine does while you drive, this app is for you. The app itself costs $49.95 (I know it's expensive) in Google Play ($49.99 in the App Store) but you will also need an OBD-II device that is capable of connecting to your car's OBD port and communicating with your phone. The communication is usually done wirelessly by creating an ad hoc connection. DashCommand puts good looking gauges and graphs on AppRadio 2 showing different engine stats like fuel consumption, air intake, vehicle torque, power, acceleration, trip monitoring and many more. I have used DashCommand on a couple of long trips I took. The app initially had a few issues which have been ironed out. More apps to come I'm sure. Stay tuned for more. How can I listen to my SIRIUS XM app? Is it via bluetooth, is the regular iphone connector enough to stream the music or is there an aux adapter for the audio output on my phone?